The 75mm T2.8 miniS4/i Cine Lens from Cooke features focus scales marked in feet and is one of a set of lightweight companions to Cooke's already established S4/i lenses. The miniS4i lenses feature an aperture range of T2.8 to T22, while maintaining the same world renowned Cooke image characteristics. This 75mm prime lens features a PL mount, which makes it compatible with most commonly used professional film and digital cinema cameras. Color-matched to intercut with other Cooke lenses, this lens combines classic, hand-fitted construction with a linear iris, cam-style focus, and /i Technology. If you are interested in a more vintage look, Cooke has optional un-coated lenses that you can use to replace the coated optics in your miniS4/1. Contacts in the mount sync with /i compatible cameras and accessories, providing lens information on focusing distance, aperture and depth of field, hyperfocal distance, serial number, owner data, lens type and focal length in both meters and feet. 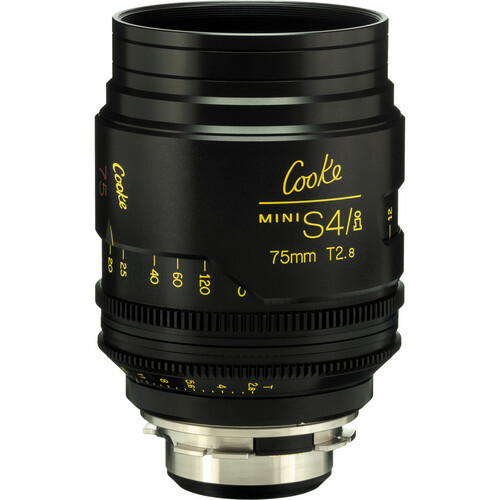 All Cooke miniS4/i prime lenses are color balanced to the Cook 5/i, S4/i, and Anamorphic/i lenses. All Cooke miniS4/i primes have a true T2.8 aperture and cover Super 35mm format. Academy Award-winning cam-style focus movement, coupled with the added benefit of a large lens barrel diameter, has allowed for an increased number of focus markings, particularly at close focus. Spherical aberration has been controlled throughout the range of focal lengths to eliminate compensation of changes in back focus with aperture. A four-point contact bearing provides a smooth, positive, backlash-free movement. Large, clear numerals on both sides of the focus barrel enable your focus puller to work from either side of the lens without remarking or flipping the lens upside down. All Cooke miniS4/i primes have a common fixed front diameter of 87mm, except for the 18mm which has a front diameter of 110mm. Each lens incorporates a focus drive gear of 121T x 0.8 mod and an iris drive gear of 119T x 0.8. The lens features an 87 mm front diameter for attaching matte box, filter ring, and add-on lens accessories. You can purchase un-coated replacement optics for you lens, which will give your images a more vintage look. Please note that this is not a simple undertaking, but it is possible for authorized lens technicians to accomplish. Box Dimensions (LxWxH) 9.5 x 7.1 x 6.7"